Find the ideal locations and hotels for a safe and comfortable holiday for one in Sri Lanka using the country experts of Boutique Sri Lanka. We have reviewed every hotel and understand where to direct you towards friendly atmospheres, fun, and towards other like-minded solo travellers. Sri Lankan people are extremely friendly to all visitors and there are sufficient sights, entertainments and activities available to satisfy any traveller alone. The boutique hotels and heritage homes provide idyllic escapes from the "real world" and tourists. Alternatively, the guest houses, yoga and ayurveda retreats may be a good option if you are hoping to enjoy time with independent travellers, the treatments and a rewarding and convivial environment. Sri Lankan people are extremely friendly to all visitors and there are sufficient sights, entertainments and activities available to satisfy any solo traveller. The boutique hotels and heritage homes provide idyllic escapes from the "real world" and tourists. Alternatively, the guest houses may be a good option if you are hoping to enjoy time with like-minded travellers. Excursions organised through hotels will often attract fellow guests and provide conversation on the long car journeys and perhaps reduce share the costs. The private and informal dining rooms of the boutique hotels invite light conversation and friendships. Yoga and Ayurvedic retreats attract many single travellers and guests find the treatments – yoga and meditation - rewarding and convivial. 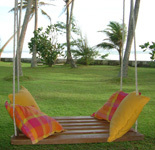 Thambapanni Retreat and Villa de Zoysa are excellent choices for yoga and beach enthusiasts. The environmental enthusiast with “organic” tastes will be attracted to the natural ambience of eco villages such as Galapita, and Ulpotha. Those in search of wildlife can be promised great leopard, bear and elephant sightings and luxury accommodation on an elitist savannah safari in the National Parks. Kulu Safaris and Eco Team host splendid campsites with soft beds and hot running water. Be aware of the “beach boys” on the South/South West coasts. They will ‘chat you up’ with sarongs, trips, restaurant and jewellery recommendations. Many are well-intentioned, but if you feel uncomfortable, politely tell them you are not interested and they will leave you alone. They are now licenced so any trouble, just let your hotel know. We have selected our driver/ guides carefully and you will feel completely at ease on long excursions. They will guide and assist you as required and take the stress out of travelling alone. Our advice is to maintain traveller/ driver friendship and always sit on the rear seats in the car-chauffeur style, as it is what they understand. If you are fair-skinned, the locals (especially children) will always be fascinated to see and talk to you. By covering up your legs and shoulders and avoiding skimpy, western fashions, the female traveller will find it easier to avoid unwelcome attention. Local people are not at all hostile and will usually greet you with a smile.